Synonyms and Other Names: Orconectes rusticus (Girard, 1852). Faxonius rusticus underwent a reclassification in August 2017, changing the genus of non-cave dwelling Orconectes to Faxonius (Crandall and De Grave 2017). Identification: Brownish-green body with dark, rusty-red spots on either side of carapace (Page 1985). Dark brown section on dorsal abdomen (Gunderson 2008). Large chelae with an oval gap when closed. The dactyl is smooth and S-shaped (Gunderson 2008). Tips of chelae are red with black bands (Page 1985). Size: Reaches a maximum of 10 cm in length, with males tending to be larger than females. Reaches maturity at about 3.5 cm (Gunderson 2008). Native Range: Ohio River basin, spanning tributaries in Western Ohio, Indiana, Kentucky, and Northern Tennessee; cryptogenic in Lake Erie (Creaser 1931, Hobbs 1974, Momot et al. 1978, Page 1985, Hobbs et al. 1989, Taylor 2000). Table 1. States with nonindigenous occurrences, the earliest and latest observations in each state, and the tally and names of HUCs with observations†. Names and dates are hyperlinked to their relevant specimen records. The list of references for all nonindigenous occurrences of Faxonius rusticus are found here. Ecology: Faxonius rusticus inhabits lakes, ponds, and streams, preferring areas with rocks, logs, or other debris for shelter. Clay, silt, sand, gravel, and rock all serve as suitable bottom types. However, F. rusticus prefers cobble habitat, which allows it to hide if necessary (Taylor and Redmer 1996). This species can thrive in areas of high flow or in standing water, but unlike other species of crayfish that can burrow in the sediment when water conditions decline, the rusty crayfish must have clear, well-oxygenated water year-round to survive (Capelli 1982 and Gunderson 2008). It is usually found at water depths < 1 meter, though it has been found as deep as 14.6 meters in Lake Michigan (Taylor and Redmer 1996). Adults typically occupy pool areas of >20 cm depth, while juveniles are usually found in shallower areas (<15 cm depth) bordering stream edges (Butler and Stein 1985). Mature rusty crayfish mate in late summer, early fall, or early spring. The female stores sperm transferred from one or more males until its eggs are ready to be fertilized—usually by late spring when water temperatures begin to increase (Berrill and Arsenault 1984). Therefore, it is possible for a single mature female carrying viable sperm to begin a new population if she is released into a suitable habitat. Rusty crayfish females can lay between 80 and 575 eggs (Gunderson 2008). Eggs hatch in three to six weeks depending on water temperature. Juveniles stay with the female for several weeks after hatching (Berrill 1978) and reach full maturity the following year upon completion of about eight to ten molt cycles. After maturity is reached, growth slows greatly, with males typically molting twice per year and females molting once. In the spring, the male molts into a sexually inactive from (Form II) and returns to its sexually active form (Form I) in the summer (Gunderson 2008). The expected lifespan of F. rusticus is 3-4 years. In its native range within the Ohio River valley, F. rusticus may seasonally be exposed to water temperatures ranging from close to 0°C up to 39°C; however, it prefers water temperatures between 20 and 25°C (Mundahl and Benton 1990). The maximum growth rate of juveniles is thought to occur at water temperatures between 26 and 28°C, while the maximum juvenile survival rate occurs at temperatures between 20 and 22°C. Therefore, adults will often displace juveniles into warmer habitats to favor maximum growth rate as a means of improving fecundity and competitive abilities (Mundahl and Benton 1990). At temperatures greater than 30°C, F. rusticus has been observed digging burrows in the sand beneath rocks near shore as a means of escaping the heat (Mundahl 1989). Faxonius rusticus individuals feed as shredders, scrapers, collectors, and predators (Lorman and Magnuson 1978). This species is an opportunistic consumer of a variety of aquatic plants, benthic invertebrates, detritus (decaying plants and animals, including associated bacteria), periphyton (algae and microbes attached to objects submersed in water), fish eggs, and small fish (Lorman 1980). Juveniles tend to feed on benthic invertebrates, such as mayflies, stoneflies, midges, and side-swimmers, more often than do adults (Hanson et al. 1990, Momot 1992). Among the options of invertebrate prey for adults, snails are a primary target (Lodge and Lorman 1987). Means of Introduction: Human activity best explains the presence of the rusty crayfish in areas outside of its native range. Angler bait bucket emptying is thought to be the primary cause of introduction and species spread (Berrill 1978, Crocker 1979, Butler and Stein 1985, Lodge et al. 1986, Hobbs et at. 1989, Lodge et al. 1994, Kerr et al. 2005; Kilian et al. 2012). 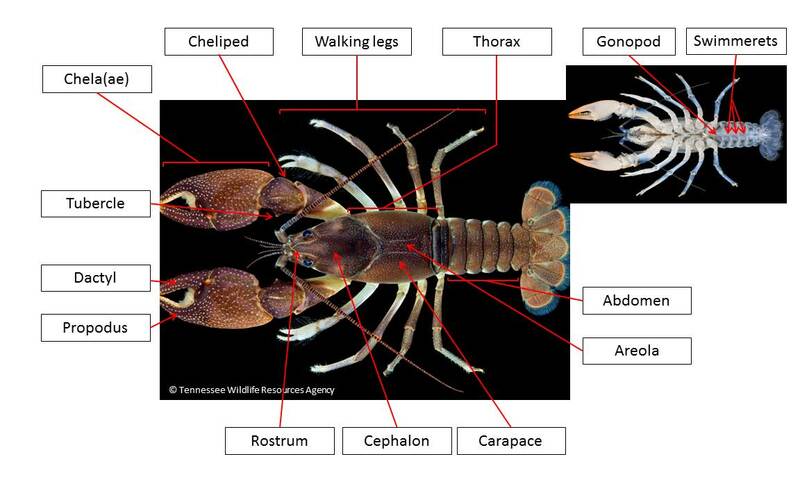 The rusty crayfish is also commonly sold to schools and biological supply houses, leading to the potential for uninformed release into the wild (Gunderson 2008; Kilian et al. 2012). Intentional release into water bodies by commercial crayfish harvesters is another suspected cause of its range expansion (Wilson et al. 2004). A further mechanism of human facilitated introduction is the intentional establishment of this species in lakes as a means of removing nuisance weeds (Magnuson et al. 1975). Once introduced to a new body of water, this species can move an average of 29 meters per day (Byron and Wilson 2001) and colonize the entire littoral zone up to 12 meters depth (Wilson et al. 2004). Status: Faxonius rusticus is established in twenty states: Colorado (Illinois Natural History Survey 2011), Connecticut (Mills et al. 1997), Iowa (Leon et al. 2016); Illinois (Michigan State University 2015); Maryland (Maryland Department of Natural Resources 2012; Kilian 2013); Maine (Hobbs 1989; sighting reports); Michigan (Michigan State University 2015); Minnesota (Passe 2014); North Carolina (Fullerton and Watson 2001; North Carolina Wildlife Resources Commission 2017); eastern Nebraska (M. Wright pers. comm. ); southern Nevada (sighting reports); northern New Jersey (Walker 2002); New York (Walker 2002; Dresser et al. 2016); Ohio (Peters 2010); Oregon (Sorenson et al. 2012); Pennsylvania (iMapInvasives 2016); South Dakota (South Dakota Game, Fish and Parks 2015); Vermont (Caduto 2011); Wisconsin (Wisconsin Department of Natural Resources 2015); and West Virginia (Jezerinac et al. 1994; Loughman 2012). Its status is unknown in Massachusetts, New Hampshire, and Tennessee, as the only reported introductions are from Hobbs (1989). Extirpated in Wyoming (Wyoming Game and Fish Department 2015). Impact of Introduction: Faxonius rusticus can out compete and displace native crayfish and reduce resource availability (Capelli 1982; Page 1985; Taylor and Redmer 1996; Bobeldyk and Lamberti 2008). Faxonius rusticus has the potential to impact periled species, such as the endangered Queensnake (Reid and Nocera 2015). In laboratory experiments Welch (2014) found that F. rusticus increases turbidity. Dresser et al. (2016) found that native crayfish will spend more time exhibiting agnostic behaviors in the presence of F. rusticus. Remarks: Found in streams, lakes, and ponds with varying substrates from silt to rock and plenty of debris for cover; needs permanent water, they generally do not burrow to escape dry periods. Breeding occurs in the fall and eggs laid the following spring, hatching within several weeks. The introduction of one female carrying viable sperm could start a new population. Reisinger et al. (2017) found that juveniles from the nonindigenous range have greater plasticity in behavior than juveniles from the native range, resulting in more active juveniles in the nonindigenous range. Faxonius rusticus reduces macroinvertebrate density in streams, but does not alter community composition (Kuhlmann 2016). Potential for F. rusticus to spread through estuaries as it has been shown to survive at salinities of 15ppt (Bazer et al. 2016). However, a barrier to dispersal may be water velocity, as F. rusticus does not perform well at stream velocities of 66 cm sec-1 (Perry and Jones 2018). Faxonius rusticus underwent a reclassification in August 2017, changing the genus of non-cave dwelling Orconectes to Faxonius (Crandall and De Grave 2017). Albert, D.A., T. Burton, P. Hudson, and P. Webb. 1999. Les Cheneaux coastal wetland project: a synthesis. A report submitted to Michigan Coastal Management Program, Project Number 99-3099-24. Amtstaetter, F. 2008. Fall Walleye Index Netting Summary for Whitefish Lake: 1995 to 2005. Ontario Ministry of Natural Resources Aquatics Update 2007-1. Bazer , C.E., R.L. Preston, and W.L. Perry. 2016. 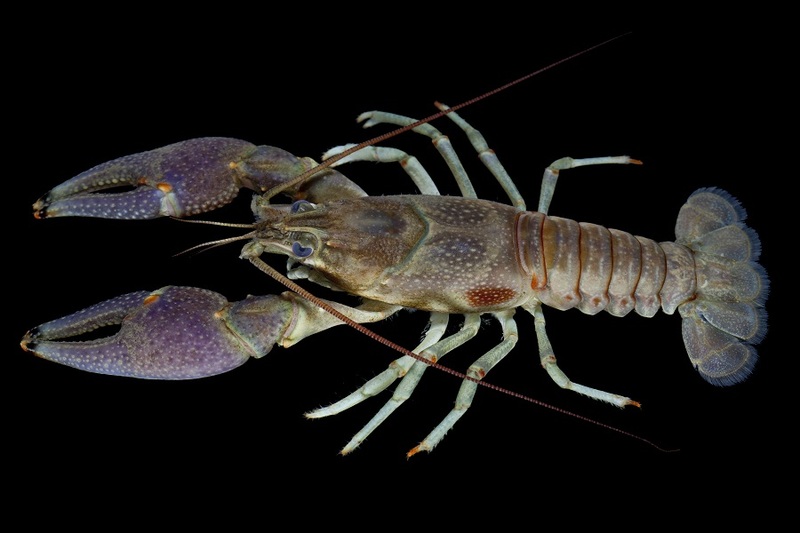 Increased salinity affects survival and osmotic response of Rusty Crayfish Orconectes rusticus Girard, 1852 and Northern Clearwater Crayfish Orconectes propinquus Girard, 1852 (Decapoda: Astacoidea: Cambaridae) as salinity increases: the potential for estuarine invasions. Journal of Crustacean Biology 36(5):607-614. https://www.researchgate.net/publication/303883161_Increased_salinity_affects_survival_and_osmotic_response_of_rusty_crayfish_Orconectes_rusticus_Girard_1852_and_northern_clearwater_crayfish_O_propinquus_Girard_1852_Decapoda_Astacoidea_Cambaridae_as_s. Berrill, M. 1978. Distribution and ecology of crayfish in the Kawartha Lakes region of southern Ontario. Canadian Journal of Zoology 56: 166-177. Berrill, M. 1985. Laboratory induced hybridization of two crayfish species, Orconectes rusticus and O. propinquus. Journal of Crustacean Biology. 5: 347-349. Berrill, M., and M. Arsenault. 1984. The breeding behavior of a northern temperate orconectid crayfish, Orconectes rusticus. Animal Behavior 32: 333-339. Bills, T.D., and L.L. Marking. 1988. Control of nuisance populations of crayfish with traps and toxicants. Progressive Fish-Culturist 50(2): 103-106. Bobeldyk, A.M., and G.A. Lamberti. 2008. A decade after invasion: evaluating the continuing effects of rusty crayfish on a Michigan river. Journal of Great Lakes Research 34: 265-275. Brazner, J.C., and D.A. Jensen. 2000. Zebra mussel [Dreissena polymorpha (Pallas)] colonization of rusty crayfish [Orconectes rusticus (Girard)] in Green Bay, Lake Michigan. American Midland Naturalist 143: 250-256. Butler, M.J., and R.A. Stein. 1985. An analysis of the mechanisms governing species replacements in crayfish. Oecologia 66: 168-177. Capelli, G.M., and J.F. Capelli. 1980. Hybridization between crayfish of the genus Orconectes: morphological evidence (Decapoda: Cambaridae). Crustaceana 39(2): 121-132. Capelli, G.M. 1982. Displacement of northern Wisconsin crayfish by Orconectes rusticus (Girard). Limnology and Oceanography 27: 741-745. Capelli, G.M., and J.J. Magnuson. 1983. Morphoedaphic and biogeographic analyses of crayfish distribution in northern Wisconsin. Journal of Crustacean Biology 3: 548-564. Charlebois, P.M., and G.A. Lamberti. 1996. Invading crayfish in a Michigan stream: direct and indirect effects on periphyton and macroinvertebrates. Journal of the North American Benthological Society 15: 551-563. Crandall, K.A. and S. De Grave. 2017. An updated classification of the freshwater crayfishes (Decapoda: Astacidea) of the world, with a complete species list. Journal of Crustacean Biology 37(5):615-653. https://doi.org/10.1093/jcbiol/rux070. Creaser, E.P. 1931. The Michigan decapod crustaceans. Papers of the Michigan Academy of Science, Arts and Letters 13: 257-276. Creed, R.P.Jr., and J.M. Reed. 2004. Ecosystem engineering by crayfish in a head water stream community. Journal of the North American Benthological Society 23: 224-236. Crocker, D.W. 1979. The Crayfishes of New England. Proceedings of the Biological Society of Washington 92: 225-252. Crocker, D.W., and D.W. Barr. 1968. Handbook of the crayfishes of Ontario. University of Toronto Press, Toronto, Ontario. 158 pp. Crooks, J.A. 2002. Characterizing ecosystem-level consequences of biological invasions: The role of ecosystem engineers. Oikos 97: 153-166. Daniels, R.A. 1998. Changes in the distribution of stream-dwelling crayfishes in the Schoharie Creek system, eastern New York State. Northeastern Naturalist 5: 231-248. DiDonato, G.T., and D.M. Lodge. 1993. Species replacements among Orconectes crayfish in northern Wisconsin lakes: the role of predation by fish. Canadian Journal of Fisheries and Aquatic Sciences 50: 1484-1488. Dorn, N.J., and G.G. Mittelbach. 1999. More than predator and prey: a review of interactions between fish and crayfish. Vie et Milieu 49: 229-237. Dorn, N.J., and G.G. Mittelbach. 2004. Effects of a native crayfish (Orconectes virilis) on the reproductive success and nesting behavior of sunfish (Lepomis spp.). Canadian Journal of Fisheries and Aquatic Sciences 61: 2135-2143. Dresser, C., and B. Swanson. 2013. Preemptive legislation inhibits the anthropogenic spread of an aquatic invasive species, rusty crayfish (Orconectes rusticus). Biological Invasions 15: 1049-1056. Dresser , C. M., Kuhlmann, M. L., and B. J. Swanson. 2016. Variation in native crayfish agonistic response to the invasion of the rusty crayfish Orconectes rusticus (Girard, 1852). Journal of Crustacean Biology 36(2):129-137. Garvey, J.E., R.A. Stein, and H.M. Thomas. 1994. Assessing how fish predation and interspecific prey competition influence a crayfish assemblage. Journal of Ecology 75(2): 532-547. Gunderson, J. 2008. “Rusty crayfish: a nasty invader- biology, identification, impacts” Minnesota Sea Grant. (http://www.seagrant.umn.edu/downloads/x034.pdf). Accessed May 11, 2011. Hanson, J.M., P.A. Chambers, and E.E. Prepas. 1990. Selective foraging by the crayfish Orconectes virilis and its impact on macroinvertebrates. Freshwater Biology 24: 69-80. Harman, W.N. 1976. A basic limnology of Otsego Lake (Summary of research 1968-1975). Biological Field Station, SUNY Oneonta, Cooperstown, NY. 50 pp. Hein, C.L., B.M. Roth, A.R. Ives, and M.J. Van Der Zanden. 2006. Fish predation and trapping for rusty crayfish (Orconectes rusticus) control: a whole-lake experiment. Canadian Journal of Fisheries and Aquatic Sciences 63: 383-393. Hein, C.L., M.J. Van der Zanden, and J.J.Magnuson. 2007. Intensive trapping and increased fish predation cause massive decline of an invasive crayfish. Freshwater Biology 52: 1134-1146. Hill, A.M., and D.M. Lodge. 1993. Competition for refugia in the face of predation risk: a mechanism for species replacement among ecologically similar crayfishes. Bulletin. Journal of the North American Benthological Society 10: 120. Hill, A.M., and D.M. Lodge. 1994. Diel changes in resource demand: Competition and predation in species replacement among crayfishes. Ecology 75: 2118-2126. Hill, A.M., and D.M. Lodge 1995. Multi-trophic-level impact of sublethal interactions between bass and omnivorous crayfish. Journal of the North American Benthological Society 14: 306-314. Hill, A.M., and D.M. Lodge 1999. Replacement of resident crayfishes by an exotic crayfish: The roles of competition and predation. Ecological Applications 9: 678-690. Hobbs, Jr. H.H. 1974. A checklist of the North and Middle American crayfishes (Decapoda: Astacidae and Cambaridae). Smithsonian Contributions to Zoology 166(i-iii): 1-161. Hobbs, H.H. III, J.P. Jass, and J.V. Huner. 1989. A review of global crayfish introductions with particular emphasis on two North American species (Decapoda, Cambaridae). Crustaceana 56: 299-316. Horns, W. H., and J. J. Magnuson. 1981. Crayfish predation on lake trout eggs in Trout Lake, Wisconsin. Rapports et Proce`s-Verbaux des Re´unions du Conseil International pour l’Exploration de la Mer 178: 299-303. Illinois Department of Natural Resources (ILDNR). 2005. Title 17, Conservation, Chapter Ib, Department of Natural Resources, Fish and Wildlife, Section 805, Injurious Species. Illinois Administrative Code. Available http://www.dnr.illinois.gov/adrules/documents/17-805.pdf . Accessed 25 May 2012. Jones, P.D., and W.T. Momot. 1983. The bioenergetics of crayfish in two pothole lakes. Freshwater Crayfish 5: 193-209. Jones, C.G., J.H. Lawton, and M. Shachak. 1994. Organisms as ecosystem engineers. Oikos 69: 373-386. Kerr, S.J., C.S. Brousseau, and M. Muschett. 2005. Invasive aquatic species in Ontario: a review and analysis of potential pathways for introduction. Fisheries 30(7): 21-30. Kilian, J.V., R.J. Klauda, S. WIdman, M. Kashiwagi, R. Bourquin, S. Weglein, and J. Schuster. 2012. An assessment of a bait industry and angler behavior as a vector of invasive species. Biological Invasions 14(7):1469-1481. Klocker, C. A., and D.L. Strayer 2004. Interactions among an invasive crayfish (Orconectes rusticus), a native crayfish (Orconectes limosus) and native bivalves (Sphaeriidae and Unionidae). Northeastern Naturalist 11: 167-178. Kreps, T.A. 2009. Scaling up: long term scale impacts of the invasion of lakes by the invasive rusty crayfish (Oroconectes rusticus). PhD dissertation, University of Notre Dame, Notre Dame, Indiana. Kuhlmann , M. L. 2016. Invasion-related change in crayfish density affects a stream macroinvertebrate community. Northeastern Naturalist 23(4):434-453. https://doi.org/10.1656/045.023.0402. Kuhlmann, M.L., and P.D. Hazelton. 2007. Invasion of the upper Susquehanna River watershed by rusty crayfish (Orconectes rusticus). Northeastern Naturalist 14: 507-518. Lodge, D.M., and J.G. Lorman. 1987. Reductions in submerged macrophyte biomass and species richness by the crayfish Orconectes rusticus. Canadian Journal Fisheries Aquatic Sciences 44: 591-597. Lodge, D.M., M.W. Kershner, J.E. Aloi, and A.P. Covich, 1994. Effects of an omnivorous crayfish (Orconectes rusticus) on a freshwater littoral food web. Ecology 75: 1265-1281. Lodge, D.M., T.K. Kratz, and G.M. Capelli. 1986. Long-term dynamics of three crayfish species in Trout Lake, Wisconsin. Canadian Journal of Fisheries and Aquatic Sciences 43: 993-998. Lorman, J.G., and J.J. Magnuson. 1978. Role of crayfishes in aquatic ecosystems. Fisheries 3: 8-10. Lorman, J.G. 1980. Ecology of the crayfish Orconectes rusticus in northern Wisconsin. Ph.D. Dissertation, University of Wisconsin, Madison, Wisconsin. Luttenton, M.R., M.J. Horgan and D.M. Lodge. 1998. Effects of three Orconectes crayfishes on epilithic microalgae: A laboratory experiment. Crustaceana 71: 845-855. Magnuson, J.J., G.M.Capelli, J.G. Lorman, and R.A. Stein. 1975. Consideration of crayfish for macrophyte control. In: P.L. Brezonik and J.L. Fox, (eds. ), Proceedings Symposium on Water Quality Management through Biological Control University of Florida, Jan. 23-30, 1975, Dept. Environmental Engineering Sciences, Gainesville, Florida. 1975. pp. 66-74. McBride, J. 1983. Meet the rusty crayfish. Wisconsin Sportsman 12(3): 42-46. McCarthy, J.M., C.L. Hein, J.D. Olden, and M.J. Vander Zanden. 2006. Coupling long-term studies with meta-analysis to investigate impacts of non-native crayfish on zoobenthic communities. Freshwater Biology 51: 224-235. Michigan. 1994. Definitions; possession of live organism. Part 413, Section 324.41301, Transgenic and Nonnative Organisms. Natural Resources and Environmental Protection Act, Act 451 of 1994. Available http://www.legislature.mi.gov/%28S%28aud33p45z3rempms4uuyrzyg%29%29/mileg.aspx?page=getObject&objectName=mcl-324-41301 . Accessed 25 May 2012. Michigan Department of Natural Resources (MIDNR). 2004. Waters Open and Regulations Governing the Taking of Wigglers and Crayfish for Commercial Purposes. In Fisheries Order 227. Available http://www.michigan.gov/documents/dnr/FO_227.10_317510_7.pdf . Accessed 25 May 2012. Minnesota Office of the Revisor of Statutes (MORS). 2008. Regulated Invasive Species. Minnesota Administrative Rules, 6216.0260. Available https://www.revisor.mn.gov/rules/?id=6216.0260 . Accessed 25 May 2012. Momot, W. T., H. Gowing, and P.D. Jones. 1978. The dynamics of crayfish and their role in ecosystems. American Midland Naturalist 99: 10-35. Momot, W.T. 1984. Crayfish production: a reflection of community energetics. Journal of Crustacean Biology 4: 35-54. Momot, W.T. 1992. Further range extensions of the crayfish Orconectes rusticus in the Lake Superior Basin of Northwestern Ontario. The Canadian Field-Naturalist. 106: 397-399. Momot, W.T. 1995. Redefining the role of crayfish in aquatic ecosystems. Reviews in Fisheries Science 3(1): 33-63. Momot, W.T. 1996. History of the range extension of O. rusticus into northwestern Ontario and Lake Superior. Freshwater Crayfish 1996: 61–72. Mundahl, N.D. 1989. Seasonal and diel changes in thermal tolerance of the crayfish Orconectes rusticus, with evidence for behavioral thermoregulation. Journal of the North American Benthological Society 8: 173-179. Mundahl, N.D., and M.J. Benton. 1990. Aspects of the thermal ecology of the rusty crayfish Orconectes rusticus (Girard). Oecologia 82: 210-216. Olden, J.D., J.M. McCarthy, J.T. Maxted, W.W. Fetzer, and M.J. Vander Zanden. 2006. The rapid spread of rusty crayfish (Orconectes rusticus) with observations on native crayfish declines in Wisconsin (USA) over the past 130 years. Biological Invasions 8: 1621-1628. Olden, J.D., J.W. Adams, and E. R. Larson. 2009. First record of Orconectes rusticus (Girard, 1852) (Decapoda, Cambaridae) west of the great continental divide in North America. Crustaceana 82: 1347-1351. Olsen, T.M., D.M. Lodge, G.M. Capelli, and R.J. Houlihan. 1991. Mechanisms of impact of an introduced crayfish (Orconectes rusticus) on littoral congeners, snails, and macrophytes. Canadian Journal of Fisheries and Aquatic Sciences 48: 1853-1861. Ontario Ministry of Natural Resources (OMNR). 2011. 2012 Ontario Recreational Fishing Regulations Summary. Government of Ontario Canada, Fish and Wildlife Services Branch. 108 pp. http://www.mnr.gov.on.ca/stdprodconsume/groups/lr/@mnr/@letsfish/documents/document/286927.pdf Accessed 25 May 2012. Page, L.M. 1985. The crayfishes and shrimps (Decapoda) of Illinois. Illinois Natural History Survey Bulletin 33(i-vi): 335-448. Pennsylvania Fish and Boat Commission (PAFBC). 2006a. Sale, purchase or barter of injurious, nonnative species. In The Pennsylvania Code. General Fishing Regulations, Title 58, Chapter 63.46. Available http://www.pacode.com/secure/data/058/chapter71/058_0071.pdf . Accessed 25 May 2012. Pennsylvania Fish and Boat Commission (PAFBC). 2006b. Prohibited acts. In The Pennsylvania Code. Propagation and Introduction of Fish into Commonwealth Waters, Title 58, Chapter 71.6. Available http://www.pacode.com/secure/data/058/chapter71/058_0071.pdf . Accessed 25 May 2012. Pennsylvania Fish and Boat Commission (PAFBC). 2006c. Transportation. In The Pennsylvania Code. Transportation of Live Fish into This Commonwealth, Title 58, Chapter 73.1. Available http://www.pacode.com/secure/data/058/chapter73/s73.1.html . Accessed 25 May 2012. Perry , W. L., and H. M. Jones. 2018. Effects of elevated water velocity on the invasive rusty crayfish (Orconectes rusticus Girard, 1852) in a laboratory mesocosm. Journal of Crustacean Biology 38(1):13-22. Perry, W.L., D. M. Lodge, and G. A. Lamberti. 1997. Impact of crayfish predation on exotic zebra mussels and native invertebrates in a lake-outlet stream. Canadian Journal of Fisheries and Aquatic Sciences 54: 120-125. Perry, W.L., J.L. Feder, G. Dwyer, and D.M. Lodge. 2001a. Hybrid zone dynamics and species replacement between Orconectes crayfishes in a northern Wisconsin lake. Evolution 55(6): 1153-1166. Perry, W.L., J.L. Feder, and D.M. Lodge. 2001b. Implications of hybridization between introduced and resident Orconectes crayfishes. Conservation Biology 15: 1656-1666. Perry, W.L., D.M. Lodge, and J.L. Feder. 2002. Importance of hybridization between indigenous and nonindigenous freshwater species: an overlooked threat to North American biodiversity. Systematic Biology 51: 255-275. Peters, J.A., T. Kreps, and D.M. Lodge. 2008. Assessing the impacts of rusty crayfish (Orconectes rusticus) on submergent macrophytes in a north-temperate U.S. lake using electric fences. American Midland Naturalist 159: 287-297. Peters, B.W. 2010. Evaluating strategies for controlling invasive crayfish using human and fish predation. MS thesis, University of Notre Dame, Notre Dame, Indiana. Phillips, R.R. 1977. A. Factors involved in social organization of the crayfish Orconectes rusticus. B. Circadian activity cycles of Orconectes rusticus. Annual Report, Biological Field Station, SUNY Oneonta, Cooperstown, NY. Ray, J., and V. Stevens. 1970. Using Baytex to control crayfish in ponds. Progressive Fish-Culturist 32: 58-60. Reid , S. M. and J. J. Nocera. 2015. Composition of native crayfish assemblages in southern Ontario rivers affected by rusty crayfish (Orconectes rusticus Girard, 1852) invasions – implications for endangered queensnake recovery. Aquatic Invasions 10(2):189-198. Reisinger, L.S., A.K. Elgin, K.M. Towle, D.J. Chan, and D.M. Lodge. 2017. The influence of evolution and plasticity on the behavior of an invasive crayfish. Biological Invasions(19):815-830. http://link.springer.com/article/10.1007/s10530-016-1346-4. Rodd, J. 1999. Providing current information on monitoring and controlling the spread of harmful nonindigenous species. Aquatic Nuisance Species Digest 3(3): 1-12. Rosenthal, S.K., S.S. Stevens, and D.M. Lodge. 2006. Whole-lake effects of invasive crayfish (Orconectes spp.) and the potential for restoration. Canadian Journal of Fisheries and Aquatic Sciences 63: 1276-1285. Roth, B.M., and J.F. Kitchell. 2005. The role of size selective predation in the displacement of Orconectes crayfishes following rusty crayfish invasion. Crustaceana 78(3): 297-310. Simon, T.P. 2001. Checklist of the crayfishes and freshwater shrimp (Decapoda) of Indiana. Proceedings of the Indiana Academy of Science 110: 104-110. Simon, T.P., M. Weisheit, E. Seabrook, L. Freeman, S. Johnson, L. Englum, K.W. Jorck, M. Abernathy, and T.P. Simon IV. 2005. Notes on Indiana crayfish (Decapoda: Cambaridae) with comments on distribution, taxonomy, life history, and habitat. Proceedings of the Indiana Academy of Science 114(1): 55-61. Statzner, B., E. Fièvet, J. Champagne, and R. Morel. 2000. Crayfish as geomorphic agents and ecosystem engineers: Biological behavior affects sand and gravel erosion in streams. Limnology and Oceanography 45: 1030-1040. Stein, R.A. 1977. Selective predation, optimal foraging and the predator-prey interaction between fish and crayfish. Journal of Ecology 58: 1237-1253. Taylor, C.A., and M. Redmer. 1996. Dispersal of the crayfish Orconectes rusticus in Illinois, with notes on species displacement and habitat preference. Journal of Crustacean Biology 16: 547-551. Taylor, C.A. 2000. Systematic studies of the Orconectes juvenilis complex (Decapoda: Cambaridae), with descriptions of two new species. Journal of Crustacean Biology 20: 132-152. Usio, N., and C.R. Townsend. 2004. Roles of crayfish: Consequences of predation and bioturbation for stream invertebrates. Ecology 85: 807-822. Welch , C. 2014. Bioturbation by the invasive Rusty Crayfish (Orconectes rusticus) affects turbidity and nutrients: Implications for harmful algal blooms. Honor’s Thesis. Ohio State University. Wilson, K.A., J.J. Magnuson, T.K. Kratz, and T.V. Willis. 2004. A longterm rusty crayfish (Orconectes rusticus) invasion: dispersal patterns and community changes in a north temperate lake. Canadian Journal of Fisheries and Aquatic Science 61: 2255-2266. Wisconsin Department of Natural Resources (WIDNR). 2004. Rusty Crayfish (Orconectes rusticus). Available http://dnr.wi.gov/invasives/fact/rusty.htm . Accessed 25 May 2012. Zhang, Y., J.S. Richardson, and J.N. Negishi. 2004. Detritus processing, ecosystem engineering, and benthic diversity: A test of predator-omnivore interference. Journal of Animal Ecology 73: 756-766.